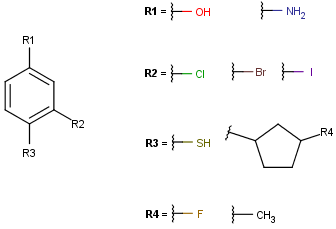 The Markush functions of the Chemical Terms language operate with Markush structures that cover a set of compounds with similar chemcal structures. The general scaffold contains three R groups, but there is also an embedded R group assigned to this structure marked as R4. According to this function, the number of possible compounds covered by this Markush representation is 18. Using Markush functions, the whole compound set can be enumerated or emphasis can be put on a subset of molecules. Here, we generate three random molecules from the example Markush structure.